It is time for this months and you can see loads of Cookie post popping up every were in the blogsphere. I must admit I don't make cookies that often, unless if I have my daughers friends comming to our place and she has been having so much school work and going for her violin lessons and concerts etc....... that she hardly have had time to ask her friends to our place. One of her best friend who come every Tuesday after school for a hour of chit chat has not been here for few weeks, as Shyama had to go for her violin lessons, to play with the piano teacher in the music academy as she also have exams for that. Her friend has been missing her visit here so much she asked Shyama if she can come on Thursday. I coudn't wait till thursday for baking cookies then i would miss the deadline. As if I know If i make something It will few days for me o load the pictures to the computer. This is my variation with thethings i had home. I like these cookies. We finally did not go to Ostende (we heard that there was work on the E40 and therefore lots of trafic jams) - we went to Namen where there was a circus festival. We too are busy with karate, music and piano academy exams. Beautiful cookies. Love the colors of the icing. I've never had a cookie like this before...it looks pretty and sounds really tasty. I love the icing flavor and the decorations! Gorgeous! The cookies look absolutely delicious...love the almond nutty texture w/ just right hard icing on top..definetly want to bake them for kids..as I have apricots and almonds handy in my pantry..
Love the pastel shades in the frosting. Nice pics! 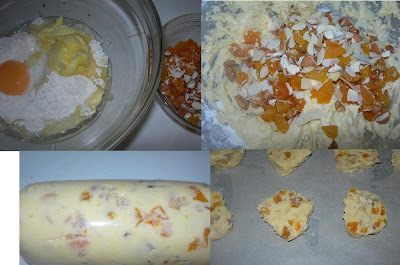 Cookies are looking colorful and yummy HC..Never thought of using apricot in cookies.. I love apricots! These cookies look and sound delicious! Lovely click and delicious cookies. I have to hurry and post mine as well. Looks nice and different. Very nice click. Thats looking so yummy and pictures too looks so good. Fabulous cookies.. Looks perfect and yummy! Beautiful decorations! Wow, those cookies look so great! I love all the flavors together! Never had apricot cookies before. Yum!! your daughter has a real gift of decorating cookies! these look so whimsical and fun to eat! They're so pretty, your daughter did a great job decorating them, I love the paste colors.! they look pretty :) nice entry! Very pretty the deco and click! such nice decorated cookies they look so yummy. I alaways like cookies . The pictures looks delicious & the cookie decoration also . Hi H.C. I just love these cookies and they look so colourful! Your daughter has done a great job on decorating them - she's a star in the making! Such a beautiful, happy and colorful cookies. Click worthy for sure. How pretty it looks - am sure it tastes delicious. HC, these are beautiful. Your daughter did an excellent job of decorating. And the recipe for the apricot cookies sounds great. I've got to try them. These look delicious! They're so pretty too, I like how you decorated them. Apricot sounds really good! & very unique decoration. Your daughter did such a nice job with the decorating! These cookies look so delicious, and they remind me of my mother-in-law's Italian cookies she bakes just about every weekend. I'm going to try your recipe to compare! Oh, I've never had an apricot cookies, but I'd love to! apricot and nut wow what a combination looks colorfull and delicious. It is so nice to have your kids showing interest in the kitchen:). She has done a wonderful job - love makes the world go round!! Wow, Happy, I love those delicious colors in your cookies. Absolute eye candy! they look delicious. thank you. These sound absolutely delicious!!! Apricots and nuts in a cookie has to be good - will bookmark these.